By Eli Gershon Tribes in Africa and Asia have been hunting elephants for their ivory and meat for thousands of years. Their hunting efforts were limited and sustainable, allowing a steady elephant population. For example, the Baggara Selem, Sudanese horsemen, have hunted elephants and shared their skills for ages - as they did with French ivory hunter and explorer Jules Poncet in the 1860s. Poncet wrote of the Selem that “several are so dexterous that they can bring the elephant down with a single thrust of the [spear]." However, the elephants that ran wild for the Selem to hunt in the 1800s are rarely seen in modern Sudan. Today, ivory used both functionally and ornamentally, has become an international sensation. Modern hunting and poaching has brought the number of African elephants down from several million to less than 500,000 throughout all of Africa in 2009. The ivory trade has existed for hundreds of years, but had not been strongly regulated until the late 1980s. Today, elephant populations in Africa are at an all time low due to poaching, hunting, and loss of habitat space. Many organizations are working towards rehabilitation of population numbers, yet their efforts seem to be futile. In the early 1970s, the demand for ivory exploded. 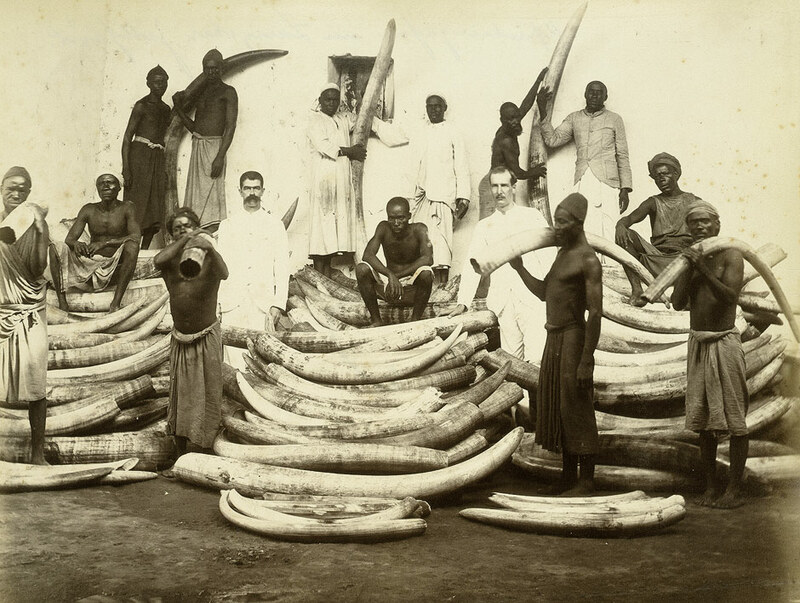 Trade and harvest of ivory increased, and the amount of ivory exported from Africa grew to a level never before seen. Almost 80 percent of the ivory being traded was taken from poached elephants, and population numbers decreased quickly. According to the World Wildlife Fund for Nature (WWF), pre-1980s population numbers reached 5 million. In 1989, the number was down to 600,000. It is estimated that 100,000 elephants were killed each year during the 1980s. Reasons for the decimation of the elephant population in the 1980s include ivory’s renewed popularity in fashion, as well as the doubling of human populations in elephant range states since the 1970s. At the 1989 Convention on International Trade in Endangered Species (CITES), governments across the world banned international trade of ivory — effective from January 1990 onwards — to protect the elephants and in response to the massive growth of the market. This ban has been quite effective at putting a halt to the trade of ivory and killing of elephants. For example, soon after the ban, the price of ivory dropped from $300 per kilogram to around $3 per kilogram. Many countries in Africa experienced a steep decline in poaching, which allowed many of the herds to recover and start to grow back to previous numbers. From 1973 to 1989, Kenya lost 90 percent of its elephant population, bringing numbers down from 167,000 to 16,000. Today, the population has doubled and hovers around 30,000. The New York Times and Smithsonian Magazine both liken the African parks, the elephants’ natural habitat to war zones. In February 2012, a massacre of 400 elephants took place in Cameroon. One hundred men on horseback raided a park, armed with AK-47 machine guns and rocket-propelled grenades. The Cameroon army tracked them for weeks before the men slipped away undetected with the ivory of hundreds of dead elephants. Massacres like this have brought the elephant populations of countries like Cameroon, Chad and the Central African Republic down to around 2 percent of what it was 50 years ago. Park rangers have become more and more militarized, as poaching has begun to increase in the past few years. Chief park ranger of the Garamba park, Paul Onyango, said, “We don’t negotiate, we don’t give any warning, we shoot first. . . . Out here, it’s not michezo (a game).” Onyango was formerly a high-ranking game warden in Kenya, but was fired after a suspected poacher died from a whipping under his supervision. Rangers now regularly carry machine guns, rocket launchers, and other military weapons in an effort to keep poachers out of the parks. While there is a legal market for ivory, a large part of the ivory trade is illegal, taking advantage of unwitting customers who don’t know the laws. The largest market is in Asia, with China being the biggest consumer of ivory. Japan also has a large ivory market, with many legal one-time, bulk ivory sales made from Africa, beginning in 1999. Elephant populations are currently low enough for them to be considered endangered. Poaching has been accelerating over the past few years, and habitat space has been shrinking. The future looks grim, although organizations like the WWF and many other funds and charities are fighting hard for the survival of the elephants. The massive drop in numbers that came from the hunting of the 1970s and 1980s hurt elephant population numbers, however work is being done every day to save the species for generations to come. Such efforts include the preservation of elephant range lands and funding of anti-poaching park rangers. If charities like the WWF, the Kenya Elephant Forum, Prince William’s charity, Tusk Trust, and others continue working tirelessly to save the elephants, population numbers could begin to bounce back. These charities must keep working, and must inform others as to how they can help if there is any hope for the African elephants to survive.